"My hips were stuck and I had lost some of my natural flexibility. This came out of the blue and I was alarmed. The physical therapy, with its non-personalized printouts of exercises, was ineffective . Then a friend recommended me to Kathryn’s classes at GYROTONIC® Seacoast. The first time I went was a year ago, and I have not stopped. I not only regained full flexibility in my hips, I gained strength that I never thought I would have. I have learned so much about my physical abilities, and have also learned to manage my flexibility so that I do not injure myself through exercise. I am a folk dancer and use the Gyrotonic techniques not only when dancing, but even when performing day-to-day activities, such as sitting at my desk and washing dishes at the sink. Kathryn is a great teacher. She’s passionate about the practice, but more importantly, she is creative about her teaching methods. She is patient when providing feedback for even subtle incorrect movements. She has helped me create new muscle memories that allow me to move freely but with strength." "I found Kathryn's studio in North Hampton randomly and tried the GYROTONIC® discipline because I had read about it in several dance magazines and was curious to experience the work first hand. I liked the work and found that it correlated nicely with my ballet training. Kathryn's knowledge of dance was helpful as she was able to suggest equipment and exercises that would assist with ballet movements. I found the GYROTONIC® apparatus safe and a good way to strengthen and reinforce dance movement as well as everyday postures. Kathryn has demonstrated the ability to assess movement dysfunction and offer corrections. Recenlty I had one of my worst back pain exacerbations and it was Kathryn's care, with mobilizations and targeted muscular releases, exercises and the studio equipment that returned me to work and everyday activities! I had tried several disciplines but credit Kathryn's work for the fastest recovery I have ever experienced with my back problems. I am a fan of the GYROTONIC® Method and a devoted client of Kathryn Londoff." "I have been a competitive tennis player all my life starting with tournaments in my teens. In addition, I have been a professional artist and teacher. Over the years, I accumulated injuries and built up scar tissue which helped make me increasingly more inflexible. I found yoga very difficult due to the static poses and Pilates had its challenges also for my body. My osteopath Dr. Jennifer Stebbing recommended the GYROTONIC® and GYROKINESIS® methods to me over other disciplines because of the use of dynamic movement in space crossing various planes. I have found that there is a strong rehab component of strengthening my core in addition to increasing my flexibility. Also, nothing gets overlooked including the hands and feet which have specific exercises. The rhythmic, spiraling and pulsating movements also have had a beneficial effect on my internal organs such as the GI tract. The wave like movements create a type of internal massage. In working with Kathryn over the past few months I have seen marked improvement in the mobility of my back and neck, better posture and less strain on my body, especially in my shoulder girdle. This has been confirmed by my chiropractor and my osteopath who are very pleased with my progress. I am learning to correct movement patterns that have contributed to injuries in the past. I would highly recommend this form of exercise to everyone." "I was not familiar with the GYROKINESIS® method until I tried it weekly for 16 weeks. As a sports medicine physician knowledgeable in movement patterns, I recognized restrictions that I had with rotation and side bending that had not changed with physical therapy, Pilates, massage, acupuncture and regular yoga practice. Within 16 weeks, the range of motion on both sides of my body equalized. General range of motion is necessary and an important step in preventing future injury. I am impressed with Kathryn's ability to teach and her ability to correct abnormal movement patterns. Her continued interest in learning to expand her knowledge base will only add to her vast experience." "As I drove home today from a morning GYROKINESIS® class, I reveled in my sense of well-being and health, of freedom of motion, of relief from pain. When I started doing the Gyrokinesis method more than 2 ½ years ago, I had numerous movement restriction/pain issues, but the two that affected my quality of life the most were hip pain that kept me awake at night and restricted shoulder movement, a result of a bicycle accident back in 2010. My doctor had written off both of these as being part of the aging process (I was 62 at the time) but I kept hoping and kept active. Then one day a Gyrokinesis class was recommended by the owner of the gym to which I belonged. Because of that recommendation, my life changed dramatically and wonderfully. The Gyrokinesis class was different from any other form of exercise I had taken. I enjoyed the class immensely because it required engagement of both the mind and body My feeling after class was that I definitely would attend the next class scheduled for later that week. Then an amazing thing happened: I woke up the next day with almost no pain in my hip!! That really got my attention. After several classes all my hip pain was gone. After a few months my range of motion in my scar tissue-ridden shoulder was back to normal and I had no pain there either. Now I take every class Kathryn offers that my work schedule allows which turns out to be three times a week – perfect!! I never find it monotonous because one can always take the movements further, experience them more deeply; and the mind-body connection encourages one to live in the moment. For a few months last year I was able to fit a 3-person group GYROTONIC® equipment session into my life and found that semi-private sessions, on the equipment, accelerated my progress in a major way. My experience has been that a combination of Gyrokinesis classes and time on the equipment is the perfect balance. 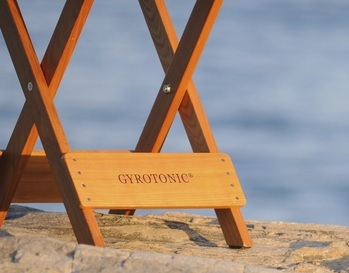 The GYROTONIC EXPANSION SYSTEM® enables me to do the things I love doing: hiking, dancing, gardening, biking. It’s given me so much and I am so grateful. Thank you, Kathryn!" "Kathryn is a fantastic, intuitive teacher. She is helping so much in my recovering from diastasis recti by re-connecting me to my pelvic diaphragm and helping with the intra-abdominal pressure too. Highly recommend to anyone - she understands the movement of muscles and how to encourage her students to reach their full potential from within." "Like breathing air and drinking water, I will do Gyrotonic exercise for the rest of my life. I am a very active person and had a hip injury two years ago. I took a break from running, horse back riding, surfing, weight and cross training and went to physical therapy to let myself heal. A year into my "healing" I started training again only to reinjure. Time and traditional PT had done nothing to heal me. I searched for an exercise method that would not just strengthen me superficially, but structurally. That is when I was referred to Kathryn and the Gyrotonic method. In a very short period of time (2 months) I found my posture changed, my core stronger than it's ever been, and my hip healed. I am enjoying beautiful runs and no pain in my body. It's also one of the safest and most challenging workouts I've done. Kathryn keeps my alignment ideal and gives my body what it needs in each session. I absolutely love it." “It’s all about being able to move effectively! 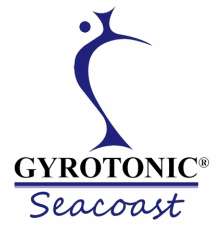 I came to Gyrotonic Seacoast after rehabbing an injured leg for 11 months. The goal was to get to the root of the issue – lack of core strength. What I found out was that with the combination of a full time desk job, riding horses 4-5 days a week and regular yoga sessions over the past 8 years – I was not using by body effectively! In working with Kathryn I have not only increased my core strength but have rediscovered increased movement in my upper back! I’ve even found ways to incorporate Gyrotonic into my hikes with my dog. A few weeks ago I started out on a hike and felt a few leg muscles starting to act up, I incorporated the Gyrotonic concepts of pelvic “narrowing” and “fifth line energy” through my leg and 5 minutes later my leg felt great and I continued on hiking for another hour with no limping afterwards! "Making a proper referral is tantamount to good treatment. Kathryn Londoff is a rare and wonderful resource for wellness in the seacoast community. When my patients are ready and responsible to take the next step outside the movement clinic I trust Kathryn will guide them. My own training and utilization of Gyrotonic and Gyrokinesis makes it a natural fit and the familiarity with these concepts allow a continuity between my clinic and Kathryn's studio." "Despite 25 years of participation in yoga, pilates and chiropractic, I suffered from chronic muscular tension and foot and back pain. If felt tired and creaky. With just six weeks of work with Kathryn, my movements are more fluid and graceful, my back pain is gone, and I am walking barefoot on the beach again. At 62 years-old, I feel stronger and more relaxed and alive. Gyrotonic te﻿chnique feels more specific and functional than many modalities that I've tried. The exercises are extremely holistic. The spiraling movement and coordinated breath coupled with Kathryn's patience and off-the-charts devotion and expertise are the perfect healing balm to get the flexibility and fluidity back in your body. She is the real deal. I encourage anyone who has been striving for relief to feel better today and get to Gyrotonic Seacoast studio as fast as you can! You will be glad you did." "At the time I came to see Kathryn, I had been seeing a chiropractor every week for chronic back pain. As an avid tennis player, I thought that playing a few times a week was sufficient to keep me flexible and my body working well. I thought that I would try something new for building a stronger core. I worked at first at just developing more body awareness and learning how to integrate my whole body into every movement. I thought it was shocking how such small, slow movements could be so intense! After a few months, not only was my back pain eliminated, but my tennis game improved as well! Now having worked with her for over a year, I see how much more coordinated, flexible and stronger I am. Every time I go to a session, I feel as though my muscle memory improves and the work gets deeper and deeper. Through Kathryn's patience, expertise and clear instruction I have come to understand how valuable this mind-body exercise is for changing and challenging my usual patterns. I highly recommend Kathryn if you would like to learn to move more efficiently!"